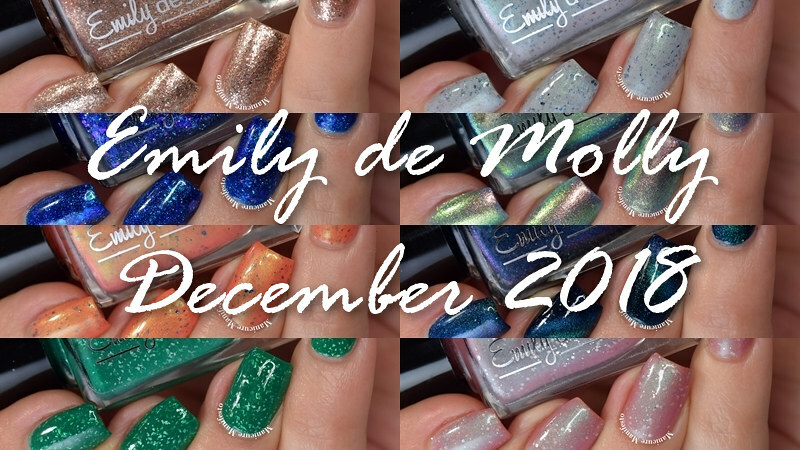 Today I have Emily de Molly's upcoming December release to share with you. 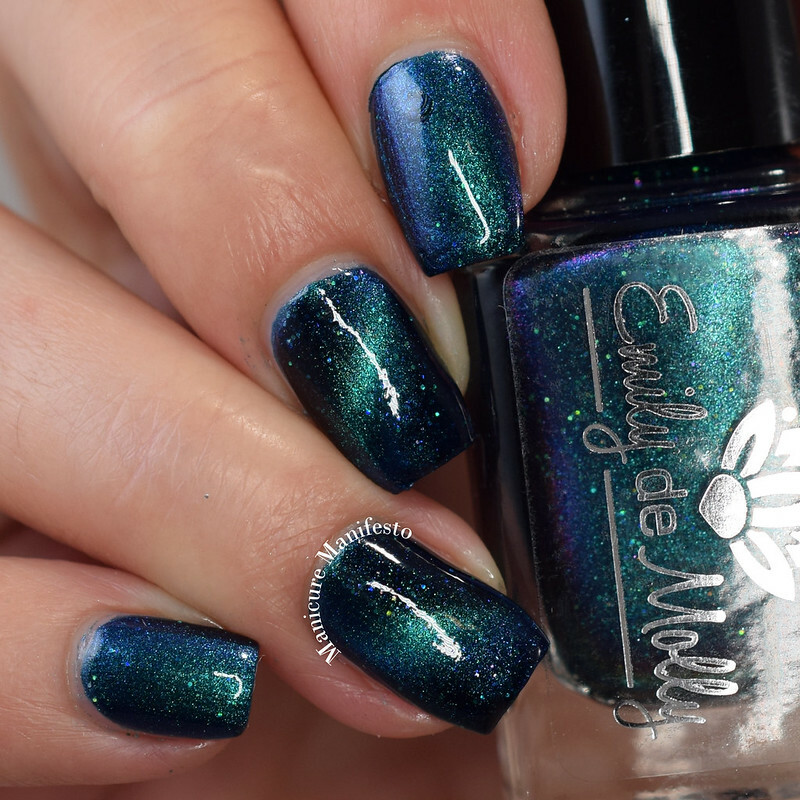 If you need a something different from the flood of red and green polishes at this time of year then this is a collection to check out. Let's take a look at swatches. 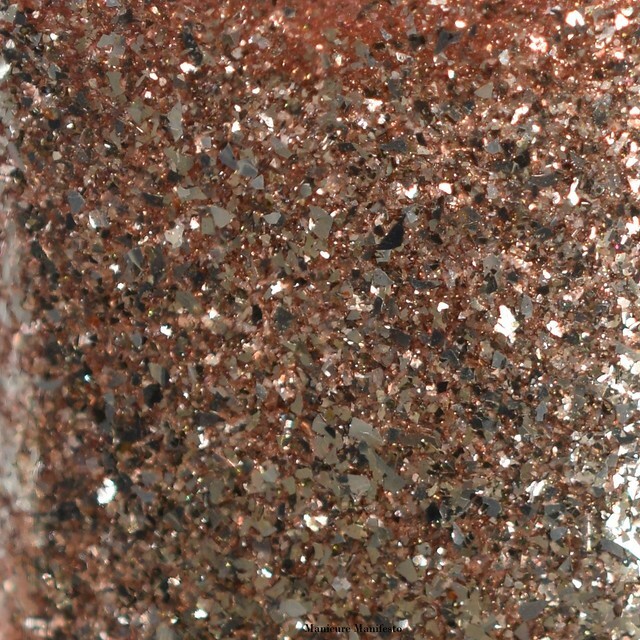 Chrome Buttons features a clear base packed with small rose gold metallic flakes. 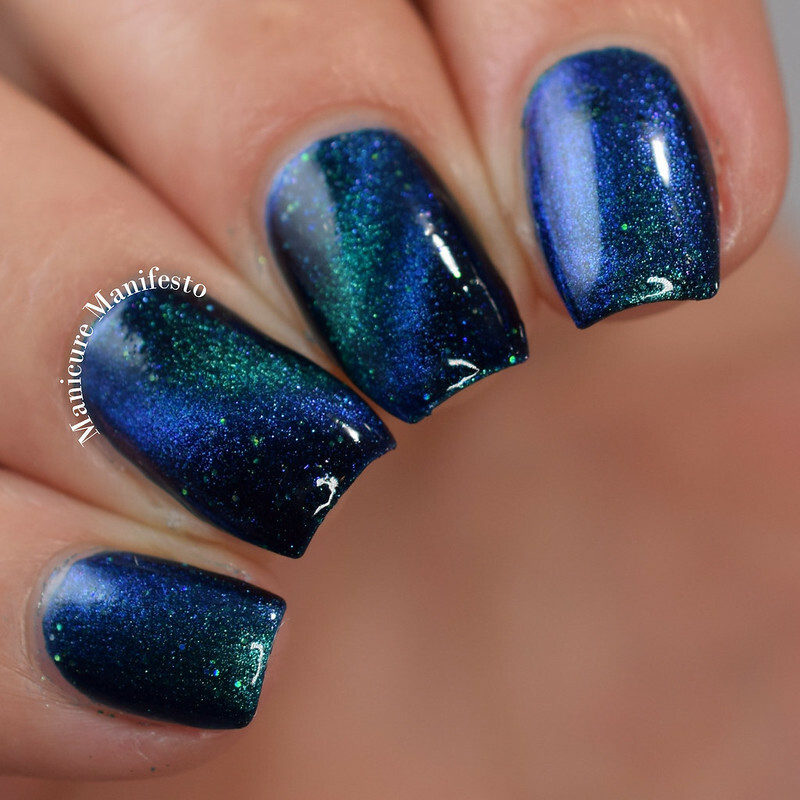 The formula was very easy to work with and took two coats for full coverage. This dries smooth on it's own but I added top coat out of habit. 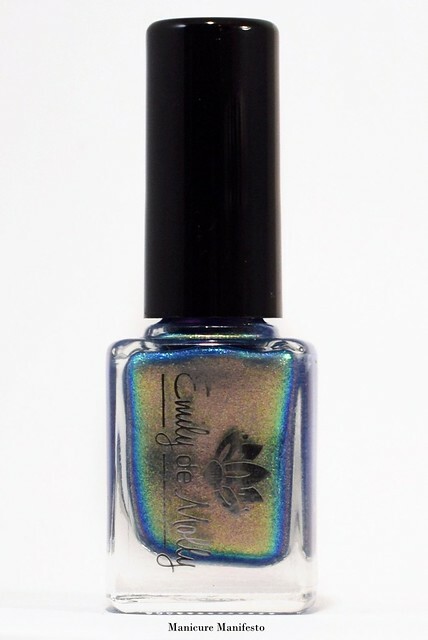 Photos show two coats of Chrome Buttons with one coat of Sephora X Shine XCEL top coat in daylight spectrum lighting. 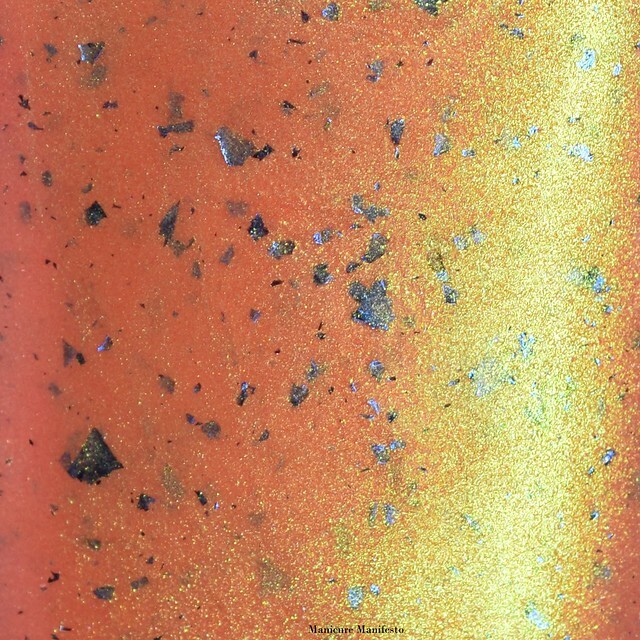 One And The Same features a tangerine orange base with a strong gold to green shifting shimmer and a sprinkling in cobalt blue metallic flakes. The formula was easy to work with and took two coats for full coverage. 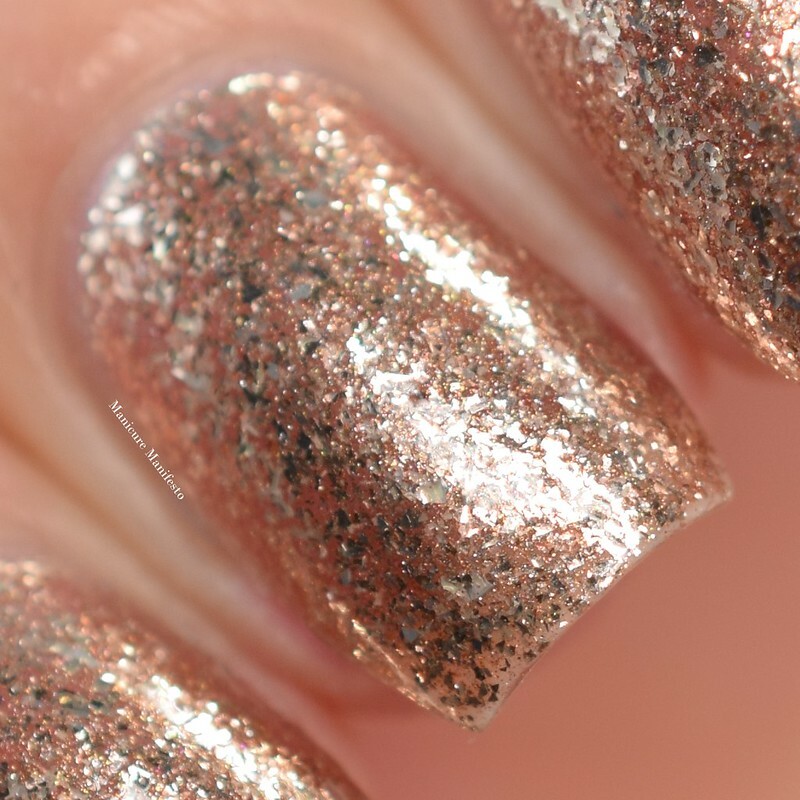 Photos show two coats of One And The Same with one coat of Sephora X Shine XCEL top coat in daylight spectrum lighting. 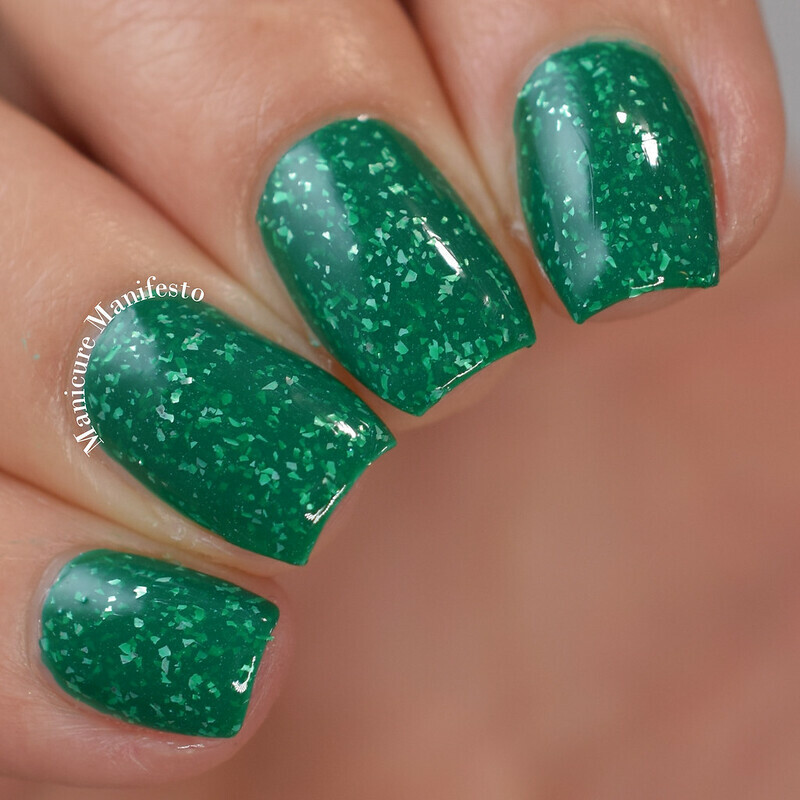 Region Specific features an medium green crelly base filled with silver flakes. 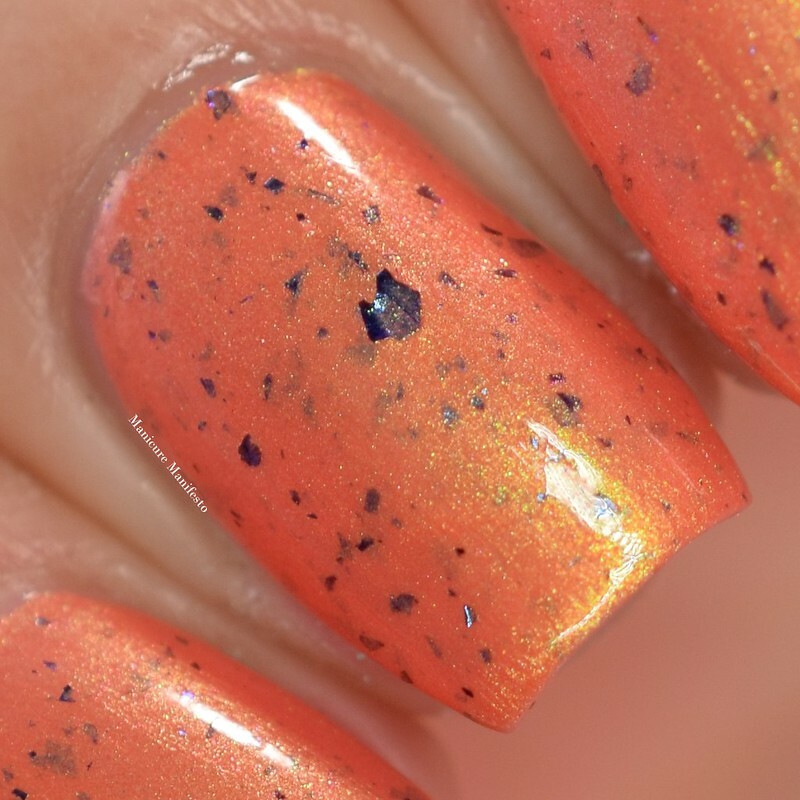 The formula was easy to work with and surprisingly pigmented for a crelly. I used two coats here for full coverage. 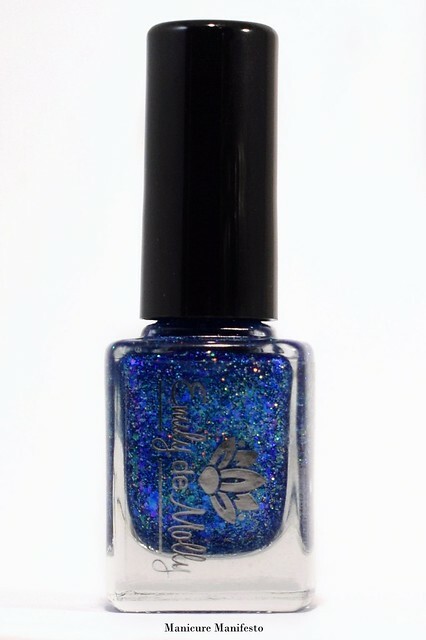 This dries to a satin finish so top coat is recommended for shine. 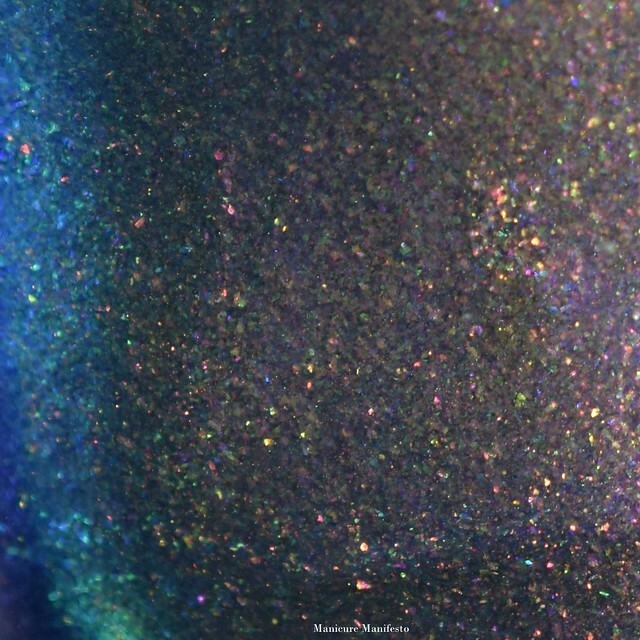 Photos show two coats of Region Specific with one coat of Sephora X Shine XCEL top coat in daylight spectrum lighting. 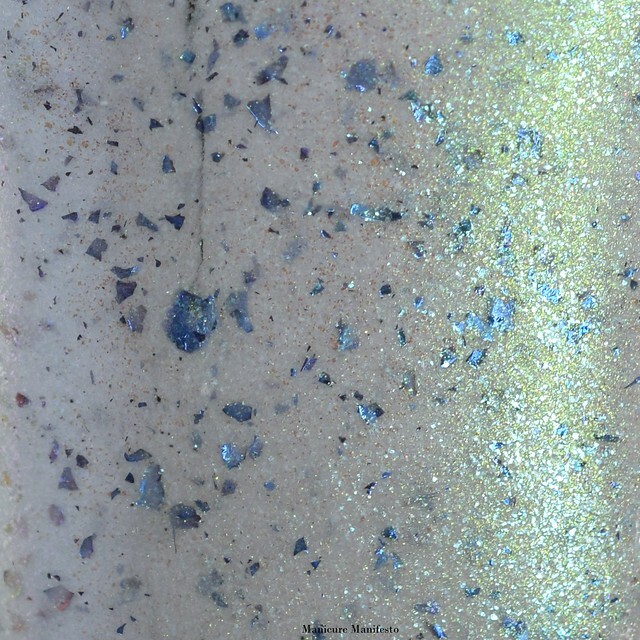 Save Your Boredom features a pale greyed out purple base filled with copper to gold to green to blue shifting aurora flecked shimmer. This thing is super shifty and super shiny. 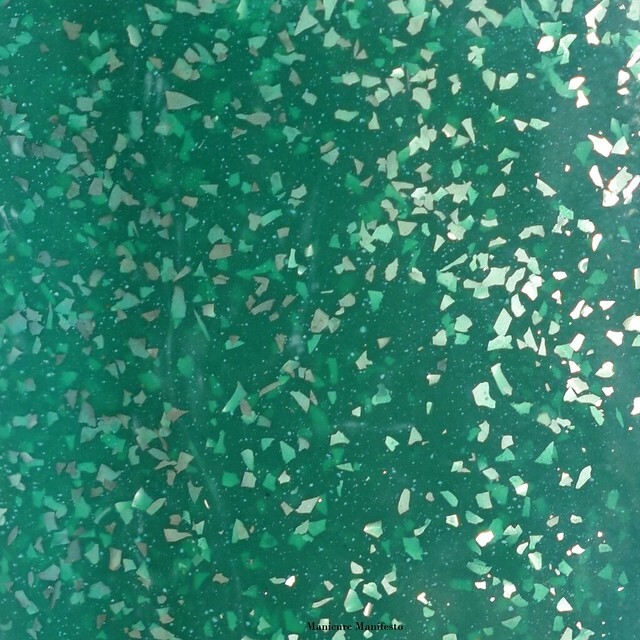 It's basically the green version of Sea Of Lies. I used three coats here for full coverage but it was so close after two that those with shorter nails or a less distinct nail line will likely find two is enough. 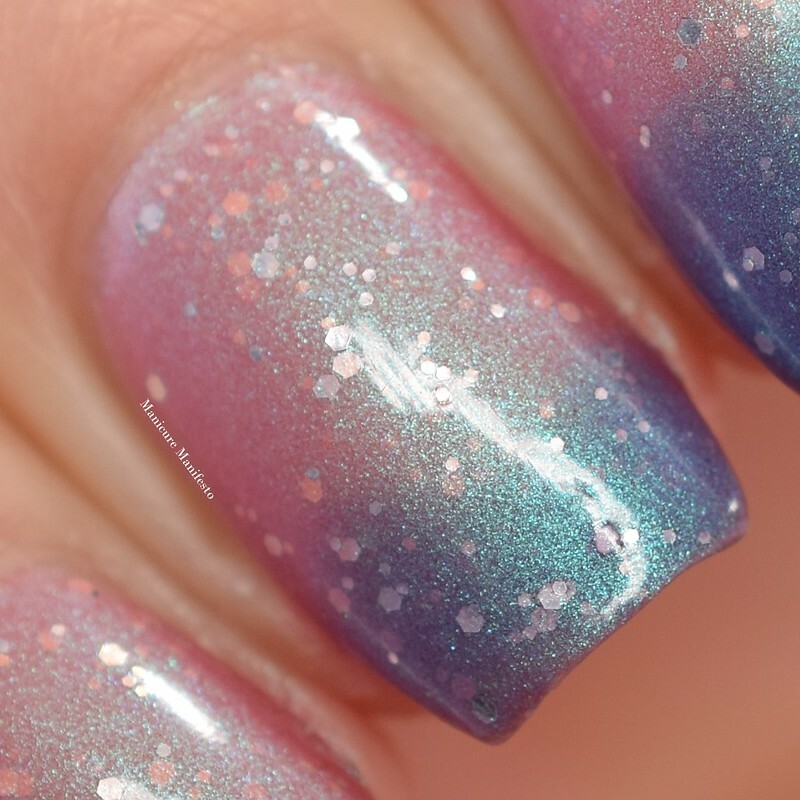 Photos show three coats of Save Your Boredom with one coat of Sephora X Shine XCEL top coat in daylight spectrum lighting. 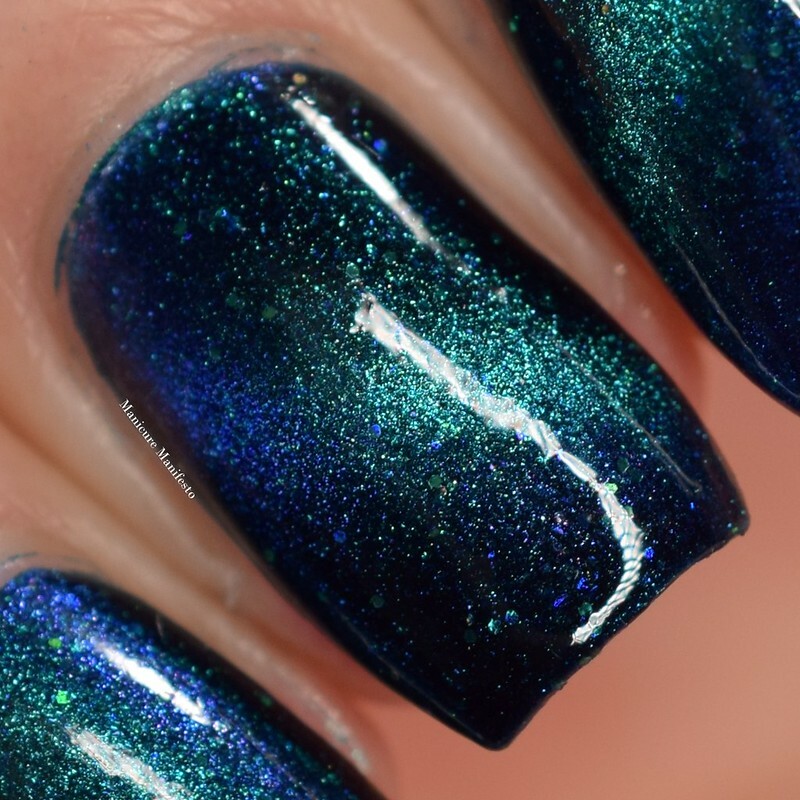 Seventh Seal features a blackened teal jelly base with a sprinkling of tiny gold holo glitters and a green to blue shifting magnetic shimmer. 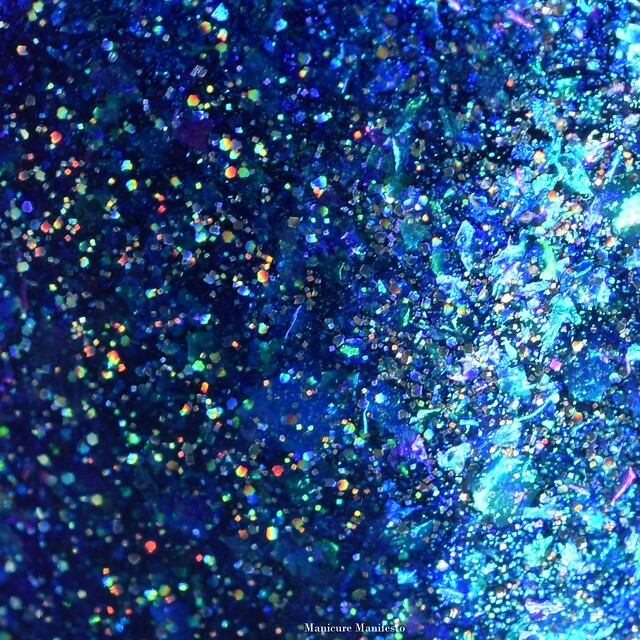 The formula took two coats for full coverage. 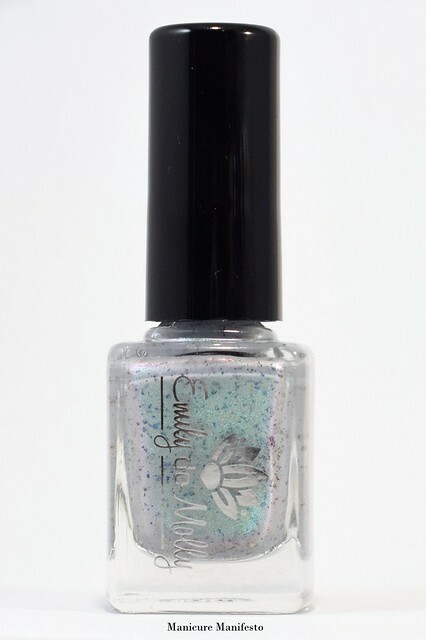 On my index and pinky fingers I didn't magnetize it since it's a pretty shimmer polish on its own. On my middle and fourth finger I applied one coat normally and magnetized the second coat with a bar magnet. I also used the magnet again after top coat on those nails. 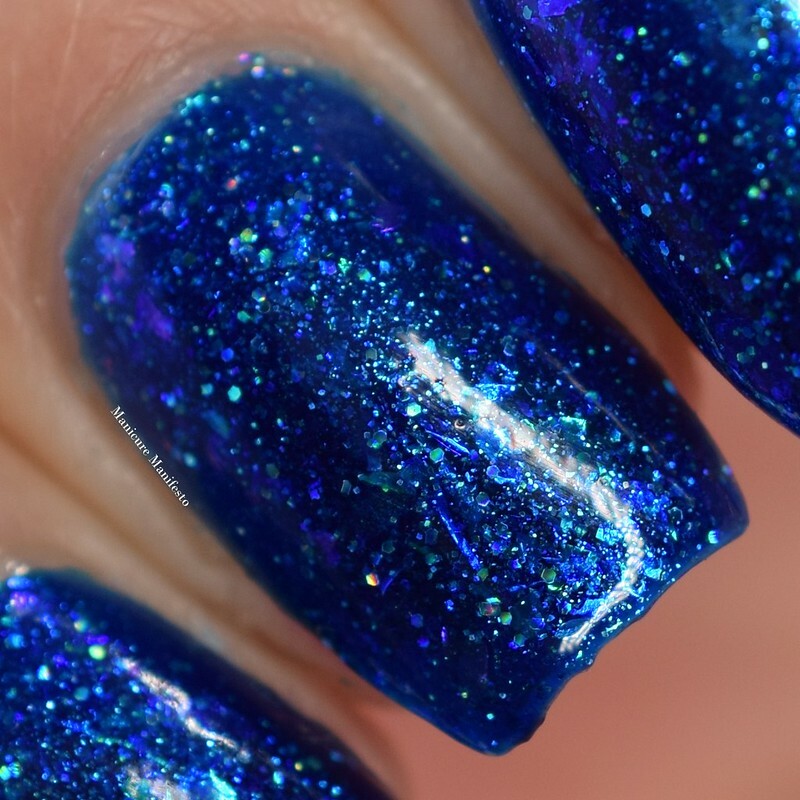 Photos show two coats of Seventh Seal with one coat of Sephora X Shine XCEL top coat in daylight spectrum lighting. 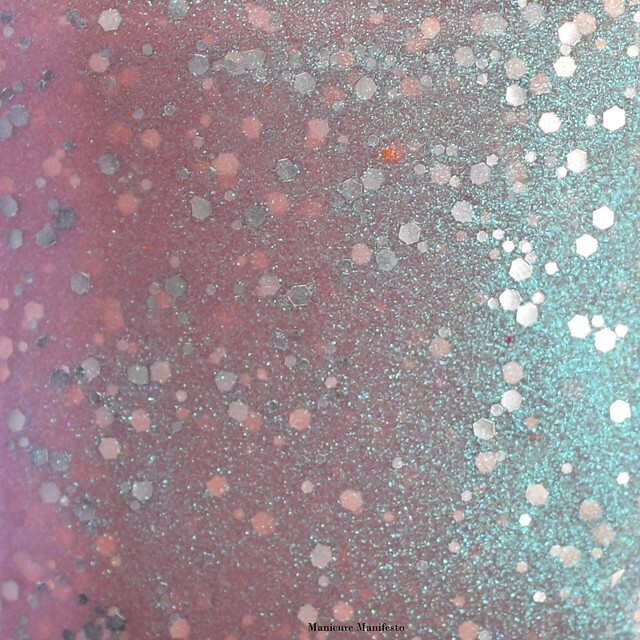 Silk And Denim features a muted blurple (cold) to dusty pink (warm) thermal base with a strong turquoise shimmer and small silver glitters. I found this thermal transitioned to the warm state at a lower temperature than most of the others I own. As a result it stayed in the warm pink state on me except when I went outside into cold winter weather. 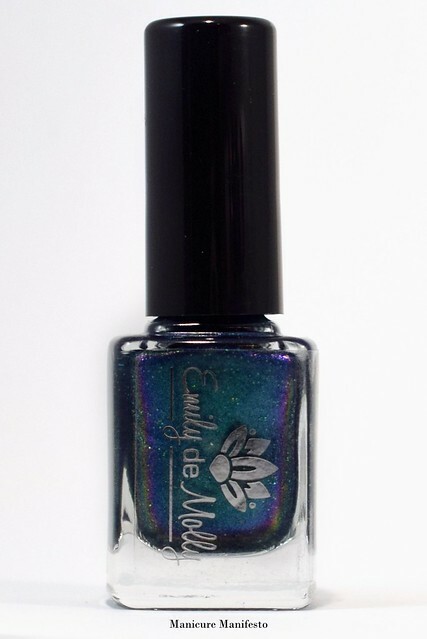 Photos show three coats of Silk And Denim with one coat of Sephora X Shine XCEL top coat in daylight spectrum lighting. 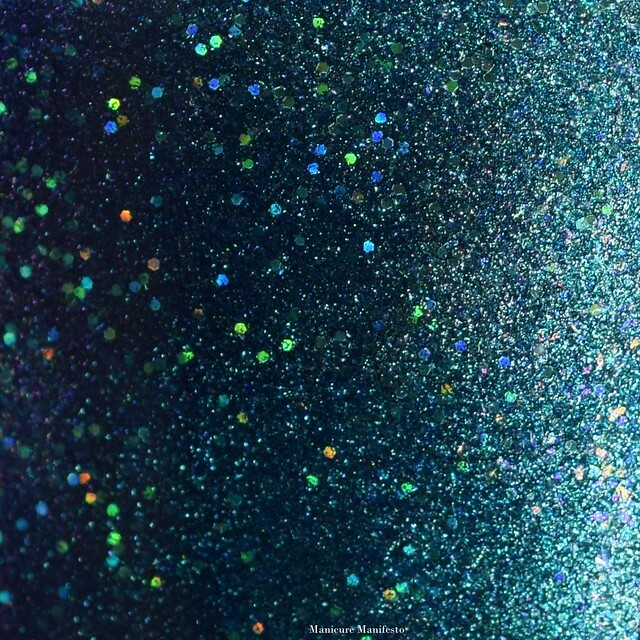 Relaxed Fit features a pale grey base filled with blue metallic flakes and a strong green shimmer. The formula was excellent taking two thin coats for full coverage. I was expecting to need three due to the pale base but was pleasantly surprised at how pigmented this shade was. 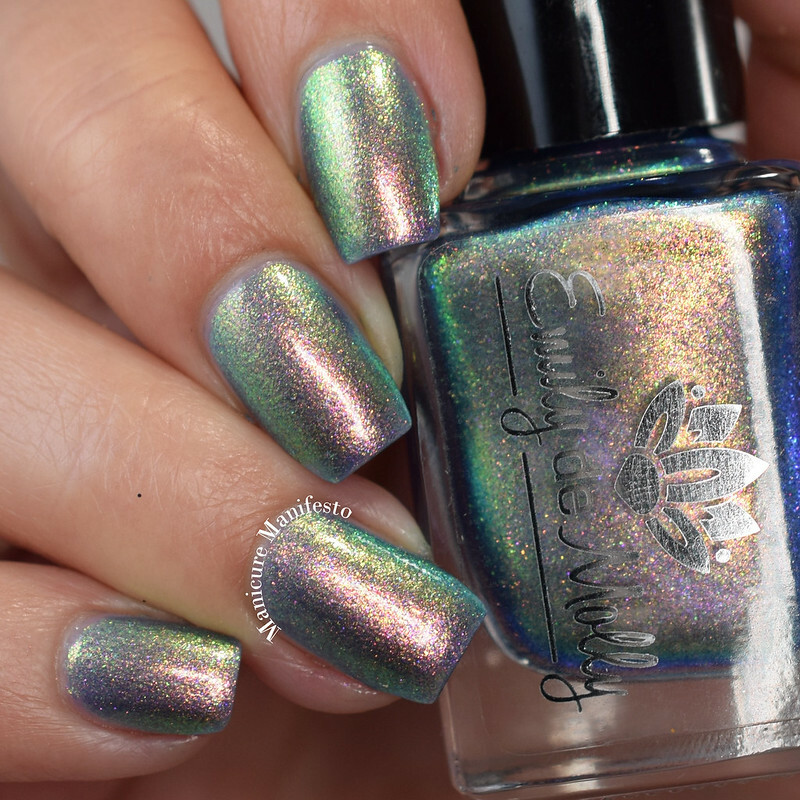 Photos show two coats of Relaxed Fit with one coat of Sephora X Shine XCEL top coat in daylight spectrum lighting. 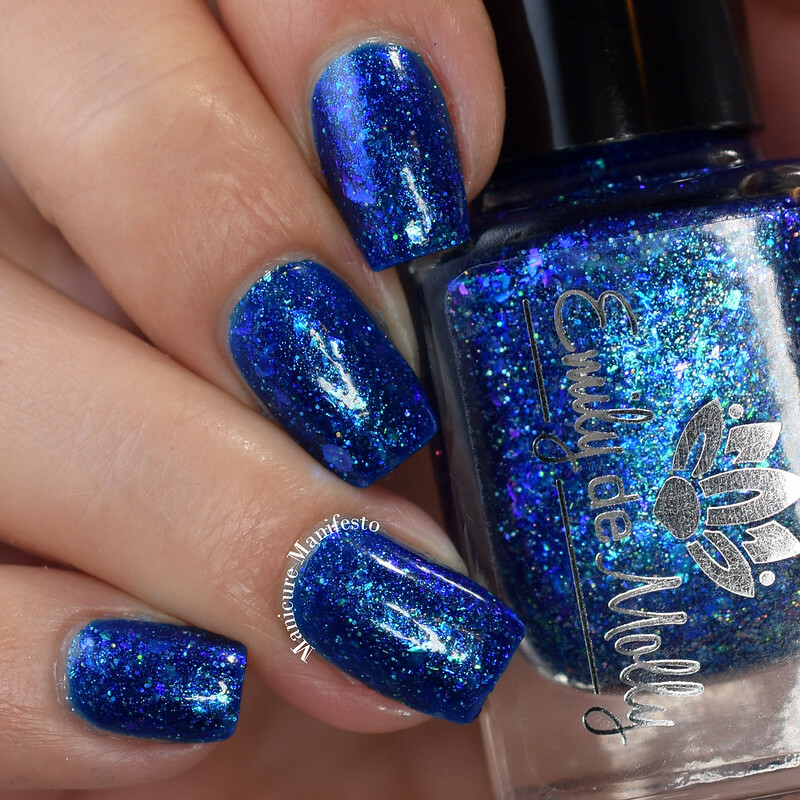 Just Your Type features a cobalt blue jelly base filled with iridescent blue flakies, blue shmmer and a tiny silver holo glitters. 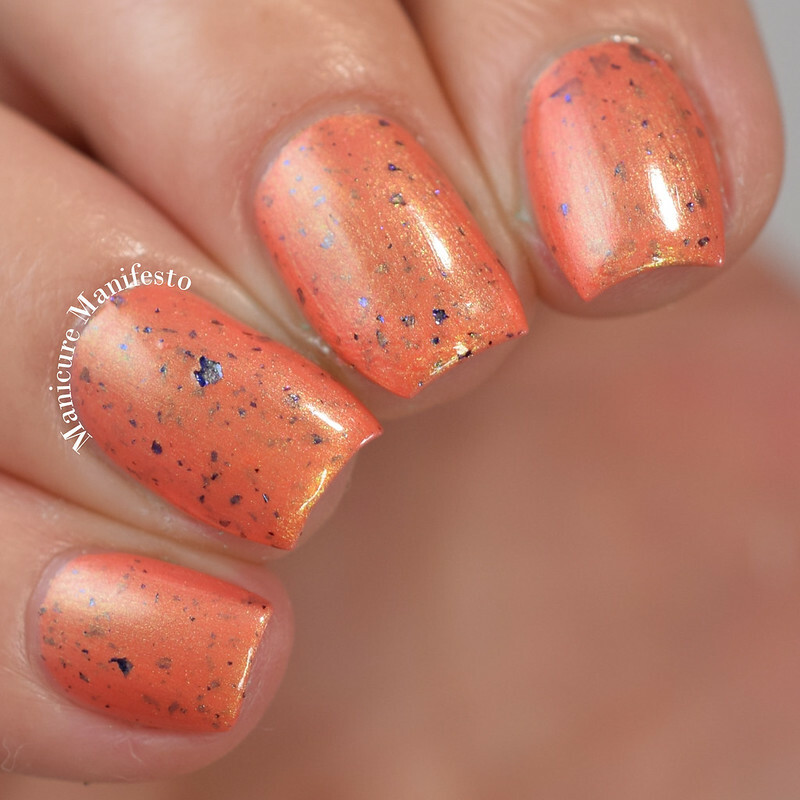 The formula was easy to work with and took two coats for full coverage. You could add a third for extra squish and depth, but it's completely optional. I used two here. 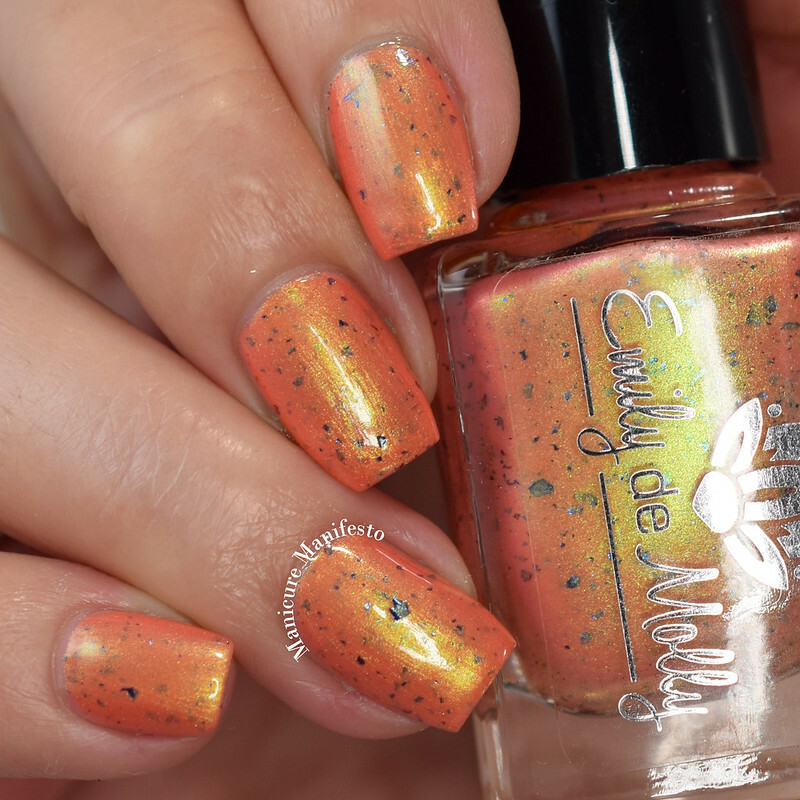 This dries with some flakie divots so top coat is recommended for a perfectly smooth finish. 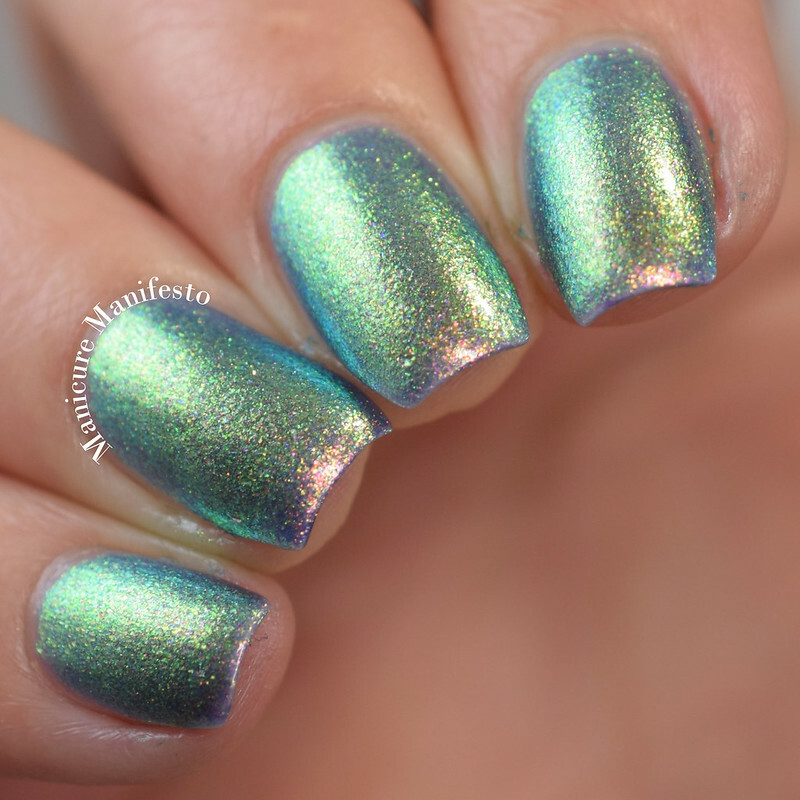 Photos show two coats of Just Your Type with one coat of Sephora X Shine XCEL top coat in daylight spectrum lighting.